2017 has been a year of inspiring new projects, great learning, and wonderful feedback! CCDC kicked off the year with a program that had been more than a year in the making! We hosted David Diamond (creator of Theatre for Living) to offer workshops over the course of three weeks! More than 80 people participated in the workshops, and about 300 people attended the forum performance. It was a fantastic experience and a great opportunity to learn - from David himself – the TfL philosophy of working with struggles faced by individuals and communities. Apart from hosting David’s Power Play on issues around mental health, CCDC undertook two major Forum Theatre projects in 2017. 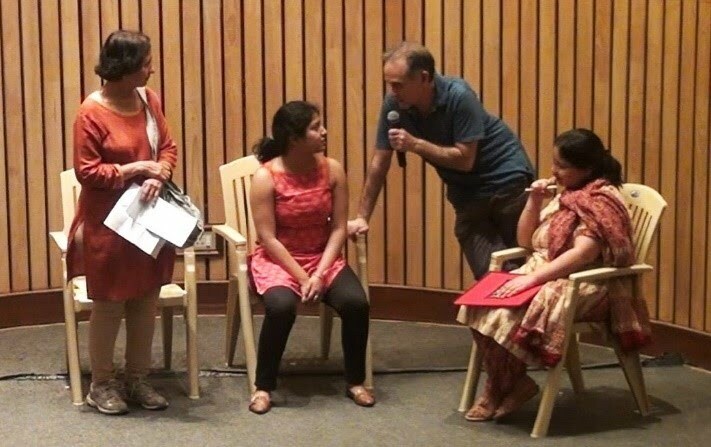 Ravi and Radha were invited by the Public Health Foundation of India (Delhi) to offer, for the first time, a comprehensive Forum Theatre training designed specially for youth to work with communities on mental health issues. The training concluded with two Forum shows - one for an English-educated audience in central Delhi, and one in a basti on the outskirts of Delhi. The different demographics of our audiences and the experience of jokering in two different languages (English and Hindi) offered interesting perspectives and much new learning. CCDC travelled to Oxford University as part of “Hearing Young Voices”, a 2-week Forum Theatre training for mental health. We worked with two groups, young people at the University of Oxford, and a school in Northamptonshire that catered to students from difficult backgrounds. The challenges faced by these young people in dealing with mental health issues were very similar to those we saw in India. Both these projects highlighted the difficulties of starting conversations around mental health, and the urgent nee to create communities of support and compassion. The first of our new Forum plays this year, addressing sexual harassment at the workplace, had three shows in corporate spaces. Each show was successful in facilitating conversations on this vital subject, and highlighted the need to break the silence around it. with the housekeeping staff of Shriram White House Apartments. Performed during the Dussehra celebrations in the apartment complex, the forum was a first time experience for the women in the play to perform their stories and personal struggles for an audience of over 100 people who had hitherto known them only as ‘housekeeping staff’. This year we conducted two introductory trainings- in May and November - that 40 people from different parts of India participated in. Responding to requests from our trainees, we launched our first Level 2 training this year with 13 participants. 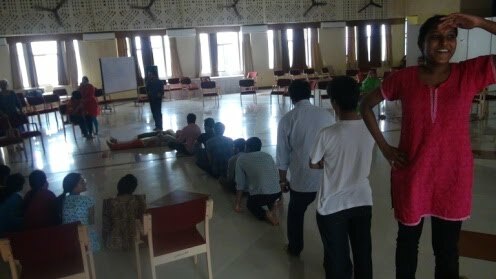 The regular invitations to conduct workshops in medical colleges continued, with Ravi leading workshops at the All India Institute of Medical Sciences, Jodhpur, and JSS Medical College, Mysore and Mahatma Gandhi Institute of Medical Sciences, Wardha. Radha was a resource person at IIT-Madras in their workshop on Critical Thinking in Healthcare for medical professionals. CCDC also conducted workshops for students and teachers from the Government College of Arts and Science, Malur, Fountainhead School, Bangalore, RGM Engineering College, and Seshadripuram Degree College. We were also invited by the Agastya International Foundation to work with a group of 24 gifted children in the age group of 4-16 years. 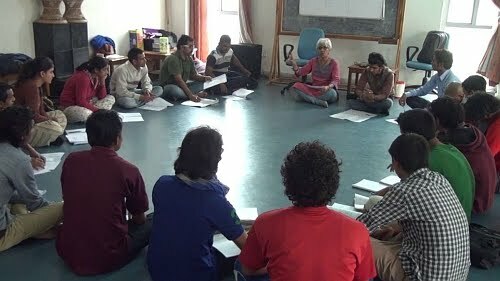 For the third year in a row, Ravi taught a course in Pedagogy and Theatre of the Oppressed for final year students of Journalism in Mount Carmel College, Bangalore. The course helped students discover their personal connections to issues in development journalism and recognise the importance of listening to different voices and opinions. Having seen, from our previous workshop, the potential of Image Theatre to open out multiple meanings in literary texts, the English Department of Jyoti Nivas College, Bangalore, invited us again this year to explore the many conflicts hidden in the complex relationships in Girish Karnad's Nagamandala. CCDC conducted a workshop for about 20 women and children, families of martyrs from the Armed Forces, as a way to help them creatively explore and express their stories. The workshop was organised by Vasantharatna Foundation for the Arts. 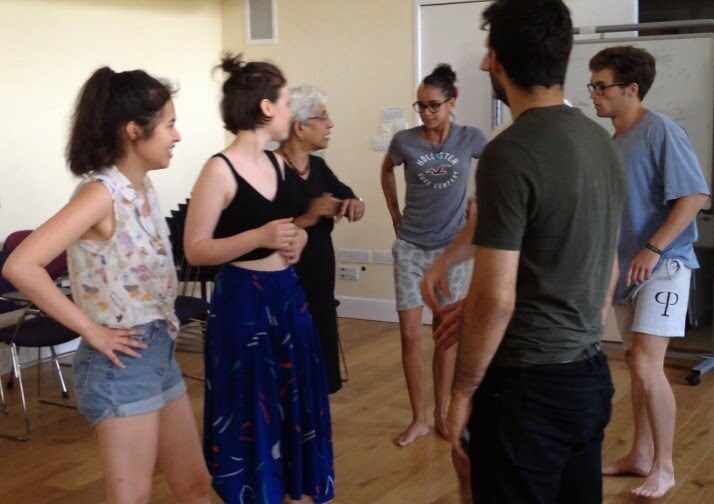 Radha was invited by Mallika Sarabhai, classical dancer, activist, and director of Darpana Academy of Performing Arts, Ahmedabad, to conduct a day long workshop for a group of young theatre practitioners. The workshop was organised as a part of the Public Health Theatre Festival being organised by Darpana. Media Studies, Christ University, Bengaluru. Responding to the research presentations by final year students of Development Communication, Ravi stressed the importance of developing an informed perspective on issues, and recognising the difference between reacting to social issues as consumers versus as citizens. We ended the year with the second edition of Diversity Dialogues, our National Theatre of the Oppressed Conference. 25 of the 35 delegates were Bangalore Jokers (BJs for short), TO practitioners who received their training at CCDC. Using Image Theatre and Forum Theatre, the sessions presented the pioneering work being done by BJs across India in the fields of Education, Healthcare, and with Communities in Conflict. In addition, several BJs shared memorable moments from their TO experience. The Conference was a testimony to the power of TO to build communities of hope around meaningful social justice work. A great way to start our journey into the new year! In 2016, our annual facilitator training in June had participants from Bangalore to Bareily, Hoshangabad to Hong Kong, Dhampur to Dubai, and Mussoorie to Muscat! The public forum performance on June 11 saw 4 plays performed to an audience of 80 people, who actively participated through interventions and discussions. Through our 9 Forum shows in Bangalore we reached out to over 400 people- students in schools, and colleges, teachers at education conferences, healthcare professionals, senior citizen groups, and residents in apartment complexes. We were able to have meaningful dialogues on issues such as body image, mental health, inequity in education, and familial relationships. The plays we performed: Permanently Imperfect, The Race, Retirement Blues. c. Confluence- National Conference at GS Medical College, Mumbai. 5. Workshops for inmates of the Bangalore Central Prison, a program organised by the NGO - Peacemakers, to facilitate their rehabilitation after release on January 26, 2017. Besides organising and conducting these workshops, courses and forums, we put in a lot of time and effort in 2016 into organising the David Diamond workshops that finally materialised in January 2017. We wish to thank all the BJs who actively contributed to this in one way or another- brainstorming, planning, giving us your time and support. 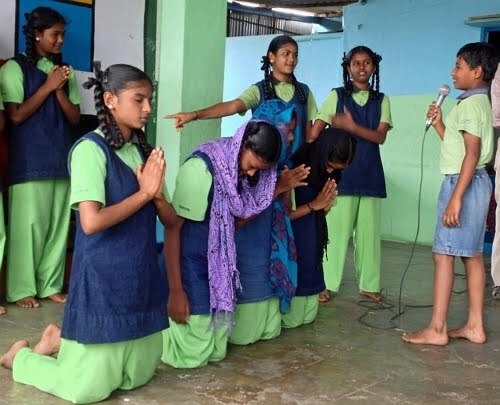 Another programme that we conceived of and planned is a study based on regular and long term TO workshops with 7th Std students at Annasamy Mudaliar School, Bangalore- ( all BJs know this school- this is where we go for our community workshop in the training). This study is ready to take off in July 2017. 4 April 6,2016 Azim Premji University "Silent Voices" Performed by MA Students. 1 January 25, 2016 Rotary Club of Bangalore, Levelle Road, Bangalore "The Race"
As we approach the close of 2015, we recommit ourselves to using TO for dialogue across differences. More than at any other time, the world needs TO now - mistrust and suspicion and fear are making people retreat into smaller and smaller worlds. Therefore we are extremely grateful, as we look back on 2015, to the many, many friends who supported us through this past year in different ways - coming to watch our forums, participating in our workshops, recommending our workshops to friends and colleagues, connecting us with more and more communities. And of course, to all BJs, for staying connected despite so many pressures. Braving the Bangalore traffic to come together to make Forums happen. Sharing experiences on the group and on Google hangouts. Pouring in support so generously, we wish the whole world could see how TO magic builds community! We would like to share with you the highlights of our activities in 2015. 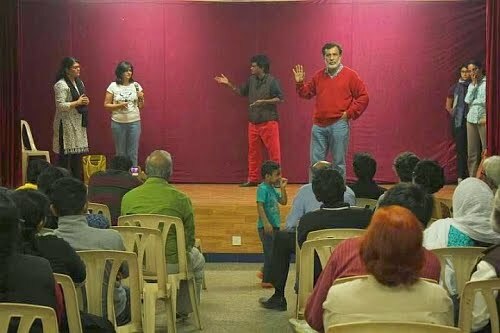 This year, we experimented with a thought- what if we did a Forum a month, in different areas of Bangalore, with different communities, and tried to create dialogues on important issues? We knew this would be a challenge, because, a) we do not have a fixed team of actors , and volunteer actors have to find time to come together every time there's a forum. b) we must find communities and spaces to hold our Forums and c) we need to have plays that different communities would find relevant and meaningful. Well, we are nothing if not adventurous! Education has always been our topmost priority, so we are delighted to report that in 2015 we amde deeepr inroads into educational spaces in different cities. 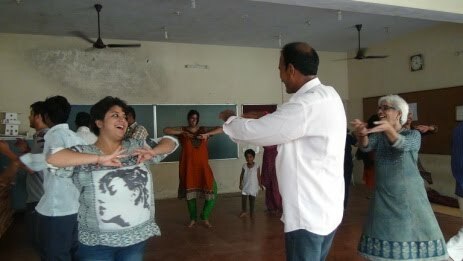 Both Ravi and Radha were invited to teach TO courses for undergraduate students. These courses at Azim Premji University ( Theatre for Dialogue and Change) and Mount Carmel College (Development Communication) were a part of the main academic curriculum, and we hope to be able to do these courses every year. We have always believed that if we wish to impact classroom transactions, we need to work with teacher educators. So we were excited when we received an invitation to work for 3 days with teacher educators from Delhi University's BElEd colleges. There were some truly great moments - of profound learning, tremendous enthusiasm, and awe inspiring courage. Yet another feather in our cap- Radha has been invited to be a member of the committee preparing a theatre curriculum for the 2 year B.Ed programme being introduced at the Tata Institute of Social Sciences( TISS) , Mumbai. 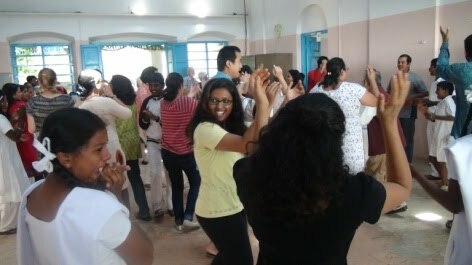 - our annual 6 Day facilitator training in May had 30 participants from different parts of India - Maharashtra, Kerala, Karnataka, Manipur - and Bangladesh. - Ravi conducted workshops in Medical Humanties at Devaraj Urs Medical College, Kolar, JSS Medical College, Mysore, MS Ramaiah Medical College, and All India Institute of Medical Sciences, Bhopal. - Radha jokered a forum performance by the students and staff of The Banyan, an NGO that works in the area of Mental Health, at the Global Mental Health Summit in Mumbai. - Other workshops - with undergraduate Arts students at Malur Government College, students of Media Studies at CMS Jain University, (both facilitated by Ravi ), with the staff at Ekalavya, an NGO working in the field of education in Bhopal, and with students from the University of Washington in Seattle. ( Radha and Ravi). How we share and brush up on the theory: The participants from our facilitator trainings- Bangalore Jokers or BJs as we call ourselves- have spread out far and wide in India and outside, and many of us stay in touch through Skype chats and Google hangouts to revisit the theory through an examination of our practice. Some of our discussion topics have been - Theatre is schools- learnings and challenges, Forum theatre with children, Understanding the "oppressor" and the "oppressed" , Experience sharing on Invisible Theatre , Language in theatre workshops for teachers. Our interns and volunteers keep us on our toes! Thank you, Prasashya, Harshvardhan, Ben, and Chetan! We loved having you with us. 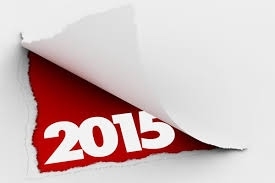 In 2016, we hope to engage with communities on a long term basis. Starting April 2016, we are collaborating with the Public Health Foundation of India on an exciting 3 year project on Mental Health. The project will train youth to be community jokers and facilitators in the use of Forum Theatre for mental health awareness. We look forward to connecting with you all through these and many more programmes in the coming year. Here's a list of CCDC's Forums in 2015, jokered by Radha and Ravi. "There's Nothing Wrong with my Mother!" 2014 was a year of experiment and innovation for CCDC. We would like to share the highlights with you. We continued our work with students - education has always been our main thrust area - but this year we did longer workshops, and were able to use Forum Theatre to address issues in the community. Some of the students from Parikrma, a school for children from underserved communities, where CCDC worked for 6 months. 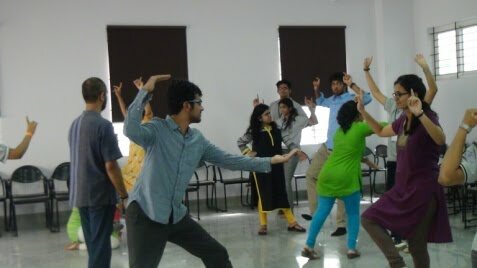 We explored a different pedagogy with students of the National School of Drama, TIE Wing, in Agartala, deepening our TO workshops with stronger theoretical inputs. We took a bold step when we partnered with Act For Change and Oxford University Dramatic Society and explored the use of Forum Theatre for creating awareness about Mental Health. 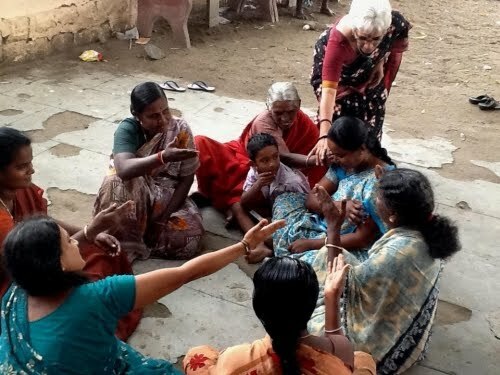 With a group of politically conscious women in Karur in Tamil Nadu, we did a series of 12 workshops, exploring personal and community issues, and redefining community leadership. 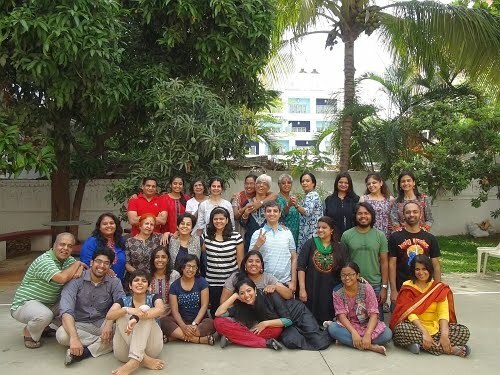 We held our fourth facilitator training in Bangalore in May 2014. 26 participants form various parts of the country participated in this 6 day training which culminated in a public Forum Theatre performance. 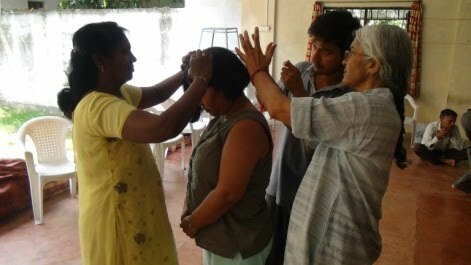 The 6 day training included an optional one day workshop on ROD. We were invited to conduct several short workshops in schools and colleges. 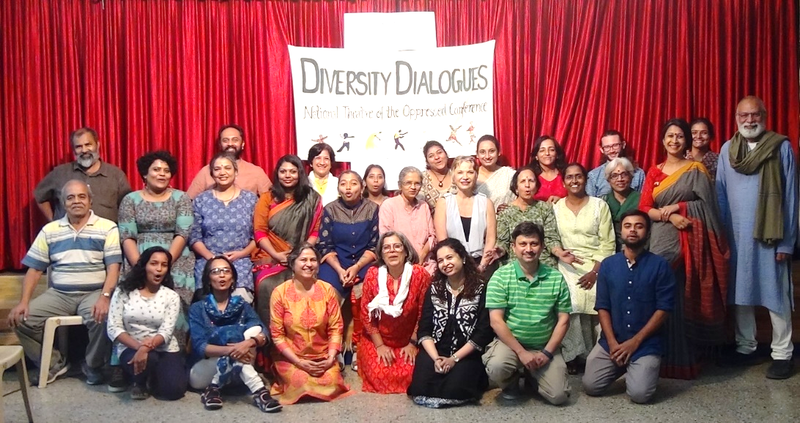 We capped it all with Diversity Dialogues - our first National Conference of Theatre of the Oppressed, bringing together writers, activists, TO practitioners and performers from all over India! A scene from a Forum play, jokered by Sanjoy Ganguly, as part of Diversity Dialogues 2014. We are looking forward to building on these rich experiences of 2014, with exciting new activities in 2015! Look out for announcements about our annual 6 day facilitator training which will be held in May 2015. 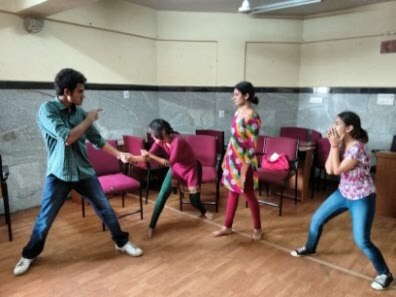 We plan to collaborate with mental health organisations in Bangalore and other places in India, and use Forum Theatre to create awareness about mental health. 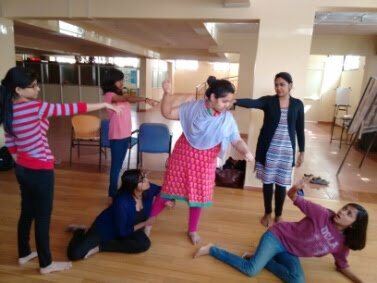 We aim to conduct short term, focussed training sessions for Bangalore Jokers (or BJs, our students from previous trainings), on Forum Theatre, Jokering, Cop in the Head, ROD, etc. We will continue our BJ meetings, with emphasis on TO readings, discussions, and practice facilitation. Short workshops - specially for school teachers- our favourite community! Medical Humanities workshops, and our work with senior citizen groups will continue to be an important area of CCDC work in 2015.